Keep your products - and workers - safe and organized with these sturdy workbenches and storage cabinets. Our workbenches come in a number of designs to match any need from lamination and packaging to computer use and technician work, and everything in between. 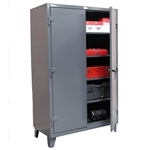 Got a lot of heavy tools or small items that need to be stored safely? 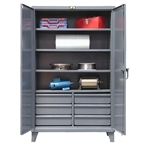 These storage cabinets are just the thing: compatible with our storage bins for easy organization of small parts and tools, and a perfect secure alternative for anything that needs to be put away safely when not in use. A great companion to our industrial storage, these benches and cabinets will help you keep ahead of the chaos of clutter. Pro-Line creates fully configured Packaging Workbench with the most common accessories. Takes the questions out of workbench configuration & provides operator with the most common accessories. Fully adjustable and offered in a range of weight capacity and configurations. The open work bench is the ideal classic work station. Fit with a rugged platform for work of all types the open work bench allows for great versatility. Our open work bench is completely customizable and can be accessorized with drawers, electrical outlet strips, back & end stops, risers and a lower shelf. Let Shelving Inc. create the perfect open work bench or for your needs. Rivet style work benches and tables offer strong support and sturdiness while keeping your workspace orderly and neat. Shelving Inc. provides a nice selection of reliable, stylish and clean rivet style benches and tables to use for storage and for projects. Ideal for basements, garages, office, commercial, light industrial and warehousing needs. Work smarter with rivet style work benches and tables. Shop through Shelving Inc.’s attractive selection of desks, tool stands and cabinets. These high quality, durable shop desks, tools stands and cabinets you will stand the test of time no matter what work environment they are used in. A wide variety of accessories are available to customize these units as well. Work using nothing but the best, work using Penco shop furniture.